FRACTIONATED DELIVERY OF UVA IS MORE EFFICIENT IN INDUCING CELL DEATH IN CULTURE THEN EXPOSURE TO AN IDENTICAL SINGLE DOSE. According to the reciprocity law of photochemistry (Bunsen-Roscoe law) a photochemical effect is the same when the product of intensity and exposure time is constant. The following experiments were performed to investigate whether this principle also applies for the response of cells in culture to ultraviolet radiation. UV-induced cell death (i.e. apoptosis) was used as an endpoint in this study and was determined by binding of annexin V, indicating membrane perturbation during early apoptosis, and by uptake of propidium iodide (PI), indicating membrane disintegration and ultimate cell death. A squamous cell carcinoma cell line (A431) was exposed to either UVA or UVB from a metal halid lamp. Each dose was delivered to the cell cultures either continuously or as four equal fractions with 15 min intervals between each fraction. Binding of annexin V to cell membranes and cellular uptake of propidium iodide (PI) was determined 6, 12, and 24 h after irradiation by FACS analysis. 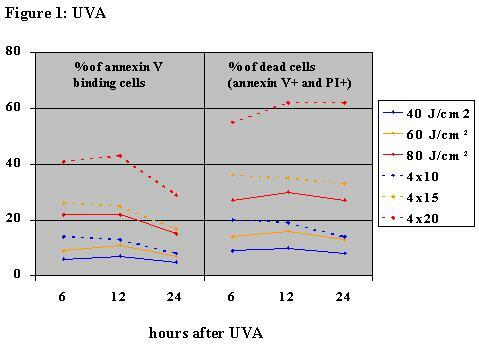 Our results indicate that UVA-induced cell death is increased by about 100% (for both parameters tested) upon fractionated exposure compared to a single dose (fig 1). 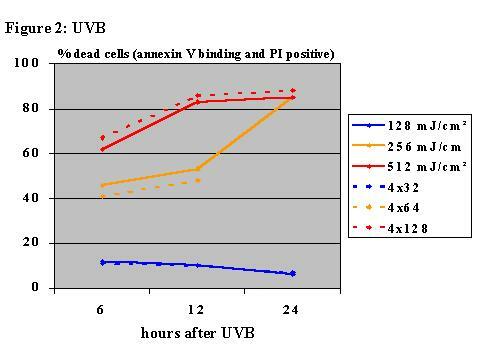 In contrast, no effect of dose fractionation on UVB-induced cell death could be detected (fig 2). We conclude that UVA time-dose reciprocity does not apply for UVA-induced apoptosis in tissue culture. As it is likely that this failure of reciprocity will also apply for the more complex biological effects of UV on living organisms, these results might be of importance for human UV exposure.